Yesterday was an absolutely gorgeous day in Copenhagen. Blue skies, 70 degrees, gentle breeze. My day got off to a good start when I checked in at the bike shop my Kona was being shipped to and it had arrived! Still in a box—and in many pieces—but there. The bike mechanics there are reassembling it and I’ll pick it up later today. I’ll be sad to say goodbye to the simple, three speed Dutch bike I’ve been renting while I’ve waited for my Kona. My rental bike along the main canal in Copenhagn. 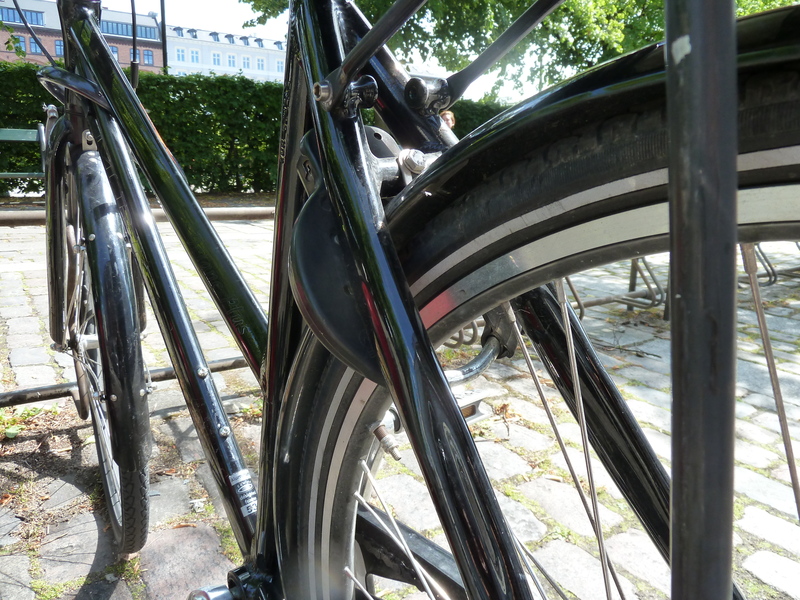 I’ll especially miss the rental because it has the same back wheel lock—or O-Lock—that about 90% of all bikes in Copenhagen have. 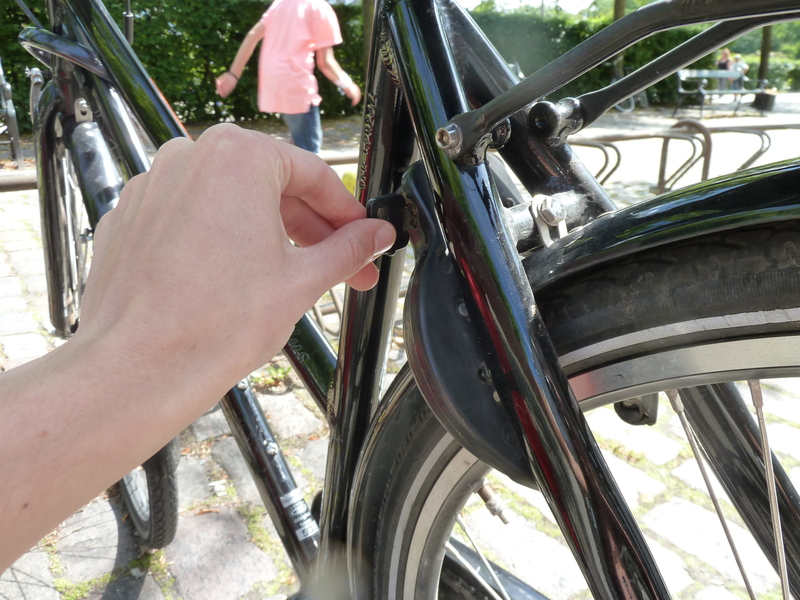 You essentially just twist a key and then a circular bolt prevents the spokes, and hence the back wheel, from moving. You don’t need a rack or pole to secure your bike to if you have an O-Lock; a lot of people just lean their bikes against walls or fences since racks tend to fill up. The O-lock just immobilizes the bike. You could still easily steal the bike by carrying it. But, no one here seems to be all that worried about bike theft. Apparently these O-Locks used to be common in the US, but this was the first time I had seen them. The hefty U-Lock I’ll be using going forward will give me more peace of mind, but I’ll miss the ease of using an O-Lock. As I was wrapping up at the bike shop, the mailman was entering the shop. He heard me speaking in English and asked me where I was from and what I was doing in Denmark. I explained that I was biking across Europe trying to figure out why European cities are easier than American cities to bike in. He seemed intrigued. Before I could get on my bike to go, he grabbed a pen and a piece of mail out of his bag and told me he would show me how to make Seattle like Copenhagen. Before I knew it, I was having another street design charrette—but this time with the mailman. The mailman drew a street with a car lane, a bike lane, and a pedestrian lane. Back of the envelop street design. “Simple!” he said. And he was right. In many ways it is very simple. Electing and supporting officials with the courage, vision, and political will to actually get the streets rebuilt correctly is a more complex matter that I decided not to take up with the mailman. Post Denmark—the postal service here—uses bicycles to deliver nearly all the mail in Copenhagen, so this man spends a lot of time out on the streets biking. I figured he would be a good person to ask about the issue of biking in inclement weather. (Thanks for the question, Gabe!) He said that just about everyone keeps cycling in the winter and if you wear the right coat and get good gloves you can stay comfortable. He did emphasize the importance of gloves several times. 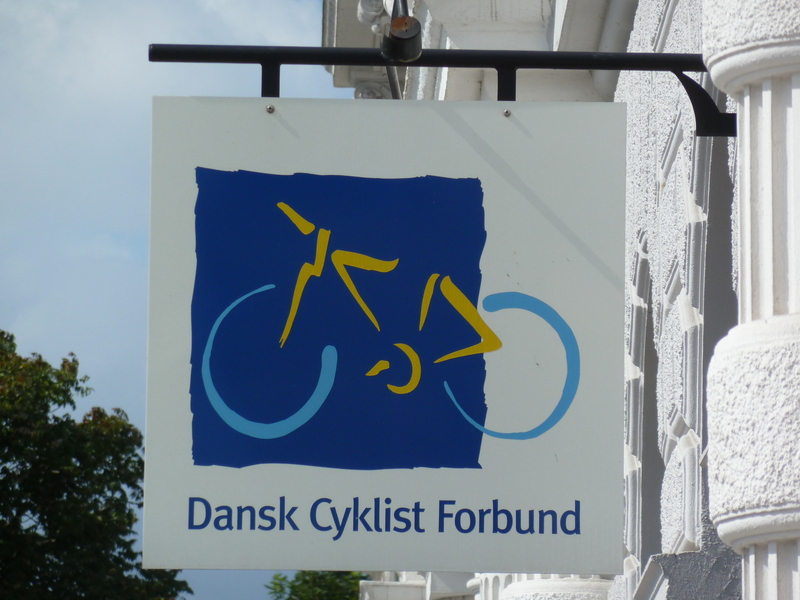 A little later in the day I met with Andreas Hammershøj at the Danish Cyclists Federation. 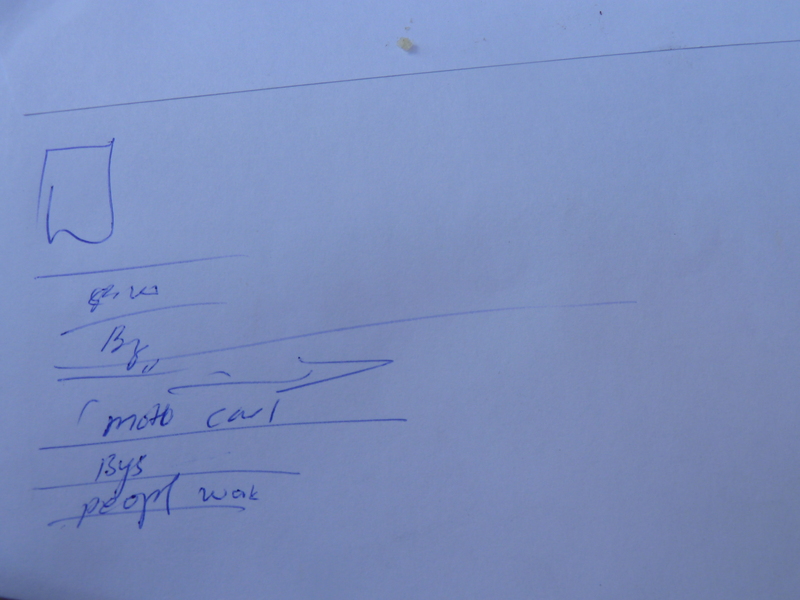 Andreas is about my age and interned with Jan Gehl while he was at university. He helped do research on Gehl’s latest book, Cities for People. Now Andreas spends most of his time working on a mapping website called cyclistic.com (it’s still in beta) that is powered by a software program called Open Street Map. Open Street Map is like the Wikipedia of maps. Users can add content and share information about bike-friendly routes, road conditions, and amenities for bikers. Andreas is pretty plugged into the bicycle policy scene here and happily answered the many questions I had for him. We touched on many important topics including the economic benefit of converting car drivers to cyclists, how to export the Copenhagen cycle culture, and other examples of widespread preference for an older, simpler technology (bikes) rather than the new technology (cars). I’ll touch on all these meaty topics in later blog posts. 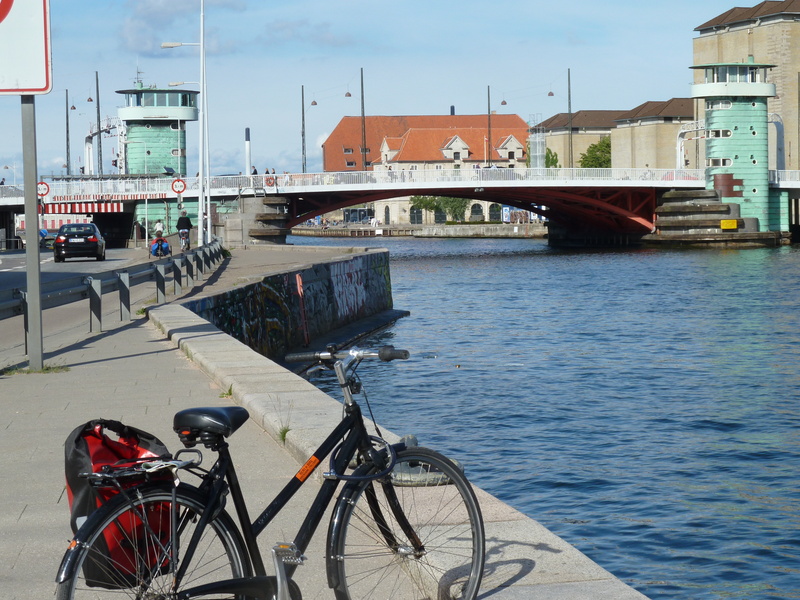 We then went for a short walk from his office to the Dronning Louises bridge. According to Andreas this bridge sees the most bicycle traffic of anywhere in Europe and maybe the world. The counters on each side of the bridge record about 15,000 bikers a day—so close to 30,000 people cross the bridge on a bike each day. I was curious about the policing of bikers and whether there were any contentious cycling-related issues brewing in the city. Andreas said that the biggest issue is that bike lanes are overcrowded at rush hour. (What an amazing problem!) The city’s cycling program is working to expand bike lanes and has established the Green Wave on main bicycle thoroughfares. If you cycle at a speed of about 20 km/hour on a Green Wave street you will hit green lights though most of the city. This helps prevent bicycle traffic jams at intersections. Andreas said that there is still some conflict between cyclists and car drivers, but most Danish drivers also ride bikes frequently so there isn’t the same caustic culture clash that you see in the States between bikers and drivers. Recently there has been a push to get more Danes to wear helmets. In fact, the Danish Cyclists Federation officially supports the wearing of helmets, although they don’t support a helmet law. Other cycling organizations think helmets generate unnecessary fear and are often ineffective anyway because people wear outdated or poorly fitted helmets. Andreas—like most other adults in Copenhagen—doesn’t wear a helmet because he’s happier and gets more enjoyment out of biking without a helmet. I tend to agree. I haven’t worn a helmet since I got here; it feels great. I’d never ride without a helmet in Seattle though because I’m so close to cars and usually biking a lot faster because I feel compelled to keep up with the pace of the car traffic. Here, people move along the very flat streets at what I would call a “peaceful pace” and obviously the clear division between cars and bikes also creates an environment that makes going helmet-free feel safe. The one rule the Copenhagen police are sticklers about is the use of bike lights at night. Lastly, Andreas shared with me that about 70-80% of Copenhageners continue to cycle in the winter. The city prioritizes the snow plowing of bike and car lanes equally. People wear their winter gear and they continue on. He said that there are probably winter days when people don’t feel like climbing on their bikes. That’s understandable—there are winter days when I don’t feel like doing anything. But, biking is how Copenhageners get around regardless of the weather conditions. Here are some cool pictures of winter biking from Copenhagenize.com. I need to go pick up my reassembled Kona now. I’m leaving Copenhagen early tomorrow morning for Aarhus, the second largest city in Denmark. It will be a long ride—just over 100 km—but the terrain is very flat and the sun doesn’t set until about 10 pm these days. Wish me luck that I’m not riding until 10 pm and that I don’t get lost! My next post will be from Aarhus where I’ll introduce you to my favorite Dane, Stine Østergaard Pedersen! I hope your trip to Aarhus is going well. Stay hydrated. Spring weather can be deceiving as far as hydration requirements. Remember, drink before you’re thirsty; eat before you’re hungry. More coaching tips will follow. Hmmm….those winter cyclists don’t exactly look happy about it! Shortly after I finished this post it started raining very hard and the temp seemed to really drop. I had to be across town and didn’t have a rain jacket with me. I guess reading the weather report is also helpful so you can be prepared. I drank some whiskey once I got in out of the rain and that really helped warm me up. Christine, when your Dad recommended you stay hydrated. I don’t think he meant with whiskey! Have fun in Aarhus! I had a great time there when Gabe was training in Fredericia. Don’t miss the Art Museum – it’s terrific! I guess I got my answer to winter riding….they just do it. And if you’re resorting to whiskey in summertime, I wonder what they’re fueled on in the middle of winter. Are you allowed to ride with an open hip flask?